Cookware is important for any and every single household. The kitchen will not be what it is without the proper appliances and proper cookware. 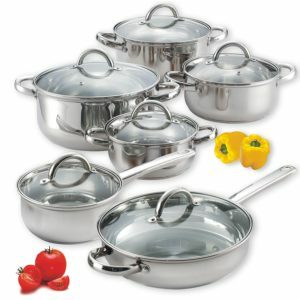 it is the dream of every homemaker and any chef to have the best pots and pans sets for their kitchen. However, with so many brands of cookware launching such a variety of utensils every single day it is a bit confusing to pick the pots and pans which are ideal for your kitchen. Everyday you get to see cookware of different materials different brands and of different types in the market ranging from aluminum to stainless steel to even clay pots. There are even cookwares available that are made out of multiple materials. But the real question lies in which one to choose from such countless variety of types available? As confusing as it might be, it is all about knowing the cookware well to understand which one will be appropriate for your cooking. Knowing the cookware better will give you a better idea of which one to buy. What To Look For In Cookware? The Price: Price pays a big role when it comes to cookware. You can find so many amazing cookwares in various different price range but the rule here is to get the best piece of cookware with the price you are comfortable with and can afford. Durability: Cookwares comes in various different materials. But you need to choose the one that is going to last you for a long time and also maintain the looks of it and stainless steel cookware the perfect long lasting and good looking ones to choose from. Maintenance: Some cookware take up a lot of hard work to keep its shine maintained as good as new especially the copper and cast iron ones. Hence, if you are looking for a pot that will require minimum amount of maintenance then stainless steel is your answer. Conductivity of Heat: An ideal cookware is the one that has the best heat conductivity and can heat up evenly throughout the pan. Copper cookwares are considered to be the best among all the materials for its heat conductivity. It conducts heats way better than stainless steel or cast iron pans. 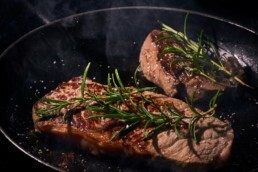 Reactivity With Food: There are a few elements that tend to react with food while cooking. Aluminum cookware has the tendency to react with acidic food like tomato and many other such dishes. So it is important to keep in mind that how the cookware material can react with the food as it will affect the quality of the dishes. Cookware is the heart and soul of any household and kitchen. Hence it is important to know your cookware better and understand which materials are best when it comes to cookware. Pans and pots comes in so many variety of materials these days and each has its own significance in the kitchen. Lets have look at some of the materials of cookware. It is considered to be one of the most durable, versatile and inexpensive cookware out there. And the best part is, it is non-reactive which means it will not react with the food and you can cook absolutely any kind of food in it. Aluminum is best known for being very lightweight and a great heat conductor which means better heat transfer. It is very affordable and easy to use considering its lightweight. However, it’s only drawback would be that it tends to react with acidic and alkaline food. But there is a solution to that too. You can get anodized aluminum cookware which is better option for cooking material. 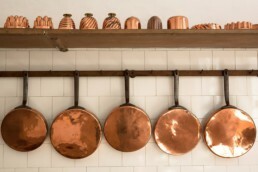 Copper cookware is best reputed for its capability to cook the food evenly throughout the pan. This is because it has great heat conductivity that spreads out evenly in the pot or pan and makes cooking even and faster. If you are looking for non- stick cookware, then cast iron pans are the answer to your prayers. These serves great as non- stick pans if seasoned appropriately and is very durable and has good heat retain capacity. Not just that, it is very inexpensive and great to cook in food as it cooks the food evenly around the pot or pan. It is very important to season the cast iron pans before putting them to use. Start by brushing the sides of it with vegetable oil and them add more oil to cover the entire bottom of the pot or pan. Put the pan into the oven and heat for an hour in low heat. As soon as the timer goes off, take the pan or pot out and wipe away any excess oil and it is good to go. Always remember to wash cast iron cookware with hot water and no dishwashing liquid. Aluminum cookware have a tendency to lose their shine with time. So wash them as soon as you are done cooking and always wash the surface with a non- scratch scour wash pad. Copper and scouring pads are not the best of friends as it can damage the tin lining in the pan. So it is best to wash it off with warm water and dishwashing liquid or a copper cleaner. You can also use white vinegar and salt solution to clean the exterior to polish the pan. It is best advised to wash stainless steel pans with water and detergent as soon as possible in order to avoid any type of staining in the cookware. Soak the pans for a while and wash it with softer materials other than scour which may cause staining. Always use nylon or plastic scrubbers while cleaning nonstick cookware. A special care manual will always be provided with the cookware for instruction on cleaning them. The AmazonBasic Non- Stick Cookware Set comes in a set of 8 pieces and contains an 8 inch frying pan, a 10 inch frying pan, 2-Quart Sauce pans, 1.2-Quart Sauce Pan that comes with a lid and a 3-Quart Casserole Pan also with a lid. 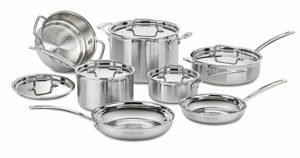 The set is fully made out of aluminum and very light and easy to use as it has a non- stick layer covering the surface. The handles are soft and cushioned with insulated materials which prevents it from heating up while cooking. The specially designed spiral bottom makes it spread the heat out evenly and is compatible with all kind of cooking platform from gas to stove to electric stove. It comes with a direction to care and wash only with hand and not use any dishwasher. Overall it is extremely durable and easy to handle cookware for your kitchen platform. 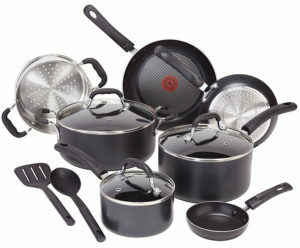 This amazing T-fal cookware set comes in 12 most amazing shapes for your convenient use. The set comes with frying pans of 8 and 10.25 inches, a dutch oven of 5- quart, covered saucepans of 1, 2 and 3- quart and lids alongside with two amazing nylon spoons one of which is solid and one slotted. 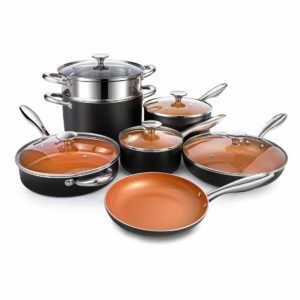 The pans and pots are all made up of hard anodized aluminum which is very durable to use. It has a unique feature called the T-fal Thermo spot heat indicator that displays when the pan is perfectly ready and preheated to use. The special pro-metal pro nonstick interior is designed to be completely nonstick and scratch proof and hence can be used with metal spoons and spatulas too. The riveted silicon handles are safe to hold onto while cooking. The set is durable and has amazing heat transfer technology called the TechnoResist anti-warp base, that helps to transfer heat evenly throughout the pan. Overall it is a best friend for every one who loves to cook and an amazing set of stylish cookware for your kitchen. 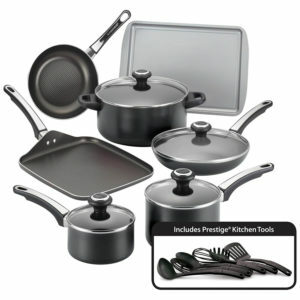 This 12 piece cookware comes with professional triple ply constructions features and consists of a 1-½ and 3-quart covered saucepans , two open skillets of 8 and 10 inch, 3-½ quart covered saucepan, a 8-quart stockpot with steamer within and a lid. The cookware set is stylish and will style your kitchen as well with its chic look. It’s shiny and polished surface will not lose its color over time and the best part is that it is un-reactive to food. It comes with a special cool grip feature in its insulated handles and greater heat conductivity with a pure aluminum core. It is fully safe to be used in the oven it a 550F temperature and also dishwasher safe so no need to waste time scouring it. It is your best friend and companion to cook and create amazing dished with. In addition to all these amazing features, it also has a drip free rim tight fitting cover that seals in the moisture and the nutrients of the food to help you prepare more healthier meals for you and your family. This T-Fal set is your perfect companion in the kitchen and if you are a new cook, this set is an absolute must have for your cooking journey. The set includes two large frying pans of 8 ans 10.25 inch, 1- quart and 3-quart saucepans, a 5- quart stock pot. The set has one egg wonder and a stainless steel steamer within with two very sheek nylon spatulas. The specially designed interior of this pan with prometal pro nonstick feature is great for cooking and makes the cookware durable for a long time. The built in Thermo- spot heat indicator shows that the pan is appropriately preheated for cooking. The most best part is that it is absolutely safe to be washed in a dishwasher which means no need to scrub and scour the pans for hours. It comes with a limited lifetime warranty so go grab your T-Fal today for the most amazing cooking experience for a lifetime. 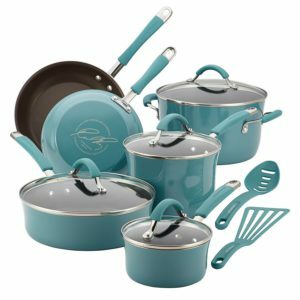 Rachael Ray Cucina Hard Porcelain Enamel Nonstick Cookware is best known for its amazing cookwares that comes in vibrant colors to style your kitchen top and help you have an amazing cooking experience. It is specially designed to enhance the hospitality the mealtime. The set includes two covered saucepans, a 6-quart covered stockpot, two skillets of 8 and 10 inches, and one 3-quart covered saute pan. The set is specially crafted with a durable interior made of aluminum and a beautiful porcelain exterior and has a nonstick technology to help food slide off the pan effortlessly. 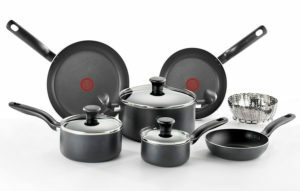 The set has dual riveted rubberized stainless steel handles and glass lids that are shatter proofs. Included in are two amazing slotted turner and spoon to complement the entire set of cookware. It is absolutely safe to be used in the oven up to 400 degrees Fahrenheit. This set will enhance the look of your modern kitchen and help you cook delicious meals effortlessly for your family and friends. Michelangelo cookware is an all in on cookware feasible for multi purpose cooking meals. This set is everything that a cook desires to prep delicious meals and is perfect for stir frying, roasting, boiling and steaming. The stylish nonstick wok made of ceramic is perfect to be used as a saute pan or use for deep frying and stir frying. Not just that, you can use it as a rice cooker, a boiler, a stockpot and many other cooking purpose. The cookware is developed with an ultra non-stick coating that is scratch resilient as it is made out of titanium interior. The woks and pans have great heat conductivity and hence heats up quickly and evenly throughout the pan. Overall it is absolutely versatile to be used as an multi purpose cookware and give you the ultimate cooking experience while you prep meals for your family. 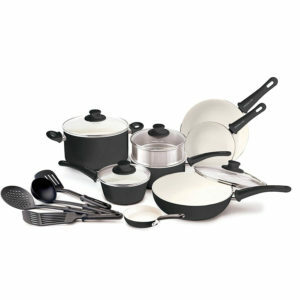 Vremi Cookware has some of the most amazing cookware sets in the market that comes in various different sets and sizes. 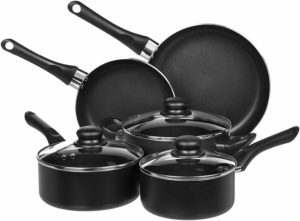 These are all in one non- stick cookware sets that comes with frying pans of different sizes along with heavy duty stock pots, soup pots and utensils along with lids. These pots and pans are made with special non toxic aluminum that doesn’t react with the food and is very durable. These are safe to be cooked in the oven. Its lightweight feature makes it very user friendly and easy to handle. If you are looking out for amazing non-stick technology cookware then this will be your perfect companion. This T-Fal set has been created with an amazing non-stick technology as its interiors are all made up of innovative ceramic which makes it stain resistant and is absolutely cadmium free. The heavy gauge aluminum bottom ensures that the meals are cooked evenly. The high quality ceramic interior is considered to be one of the most safest cooking material for cooking healthy meals for your family. The GreenLife Soft Grip Ceramic Non-stick Cookware set comes in two different set sizes one with 14 pieces and one with 16 pieces and in various different colors to complement and enhance the look of your kitchen. 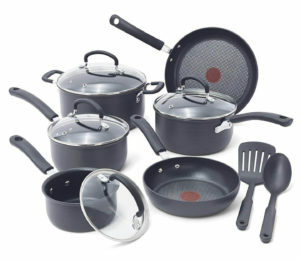 These cookware sets are made up of Thermolon ceramic non- stick and is made up without lead or cadmium. It’s sturdy body made of aluminum is very durable and is an excellent heat conductor. Hence it cooks the meal evenly throughout the pot. 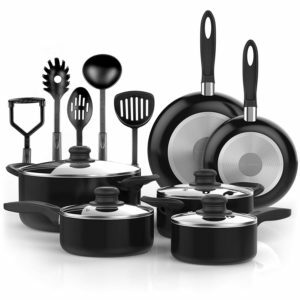 The sets includes frying pans, saucepans of different sizes, stockpots and saute pans as well along with kitchen utensils. Overall it is a cooks best friend in the kitchen to prep various types of meals for family and friends. This amazing cookware set is not only one of the best in the market but is also one of the very stylist ones and will give your kitchen retro look. It consists specially designed tough grade and copper infused ceramic pots and pans. It has a non- stick feature that doesn’t let the food stick to the surface of the pan and helps the pan maintain its looks for a long time. It is durable and can be used in the oven for up to 500 degrees Fahrenheit. 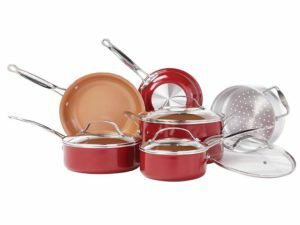 The set includes an 8 inch frying pan, a 10 inch frying pan with a lid, 1.5, 2.5 and 6 quart sauce pots with lids and an aluminum steamer insert. This is a must have kitchenware to enhance the quality of cooking experience. 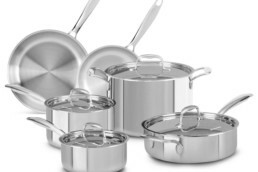 This 12 piece of stainless steel, oven proof cookware is every cooks dream. It consists of a 1.5 quart saucepan, three casserole pots of different sizes of 1.5, 2 and 3 quart, a 5.5 quart stockpot and a large 10 inch frying pan and all of this pots and pans comes in with tempered glass lids. The mirror polished pots and pans are designed with a special capsuled aluminum disc at the bottom for even heat spreading that helps to cook the food evenly. The entire set in induction compatible and can be used over any type of stove ranging from gas stoves to electric ones which makes it such a versatile set of cookware for your lovely kitchen. The Farberware High Performance Nonstick cookware is created with heavy duty aluminum that makes it absolutely durable to use. The cookware is long lasting and has a non- sticking feature to help the food slide off the pan without leaving a burnt interior. The double riveted handle provides better grip while cooking. The specially designed shatter-proof glass lids are sealed well to help retain the nutritional value of the food. The set is oven safe up to 350F and comes with quart saucepans of two sizes which makes it very convenient to use for different meal sizes, a 6-quart covered stockpot,8 ½ and 10 inch skillets, a 3-quart covered saute and two spoons to complete the set. It is an amazing cookware for your kitchen that you cannot miss out on. Cooking is an art. In order to produce the best cooked meals it is also important to select the ideal set of cookwares for every meal is different and every recipe is different too. The correct set of cookware will not only enhance the quality of the food but will also help retain its food value and further enhance the look of your kitchen as well. Do you have a favorite cookware set? Let us know in the comments below! Great buyer guide! I am a big fan of quality pans and this is what I need. I like to cook and prepare different types of food and was using really low-quality pans. I will try GreenLife Soft Grip Ceramic Non-Stick because it is not that expensive but definitely worth it. I’m definitely going to check these out. Glad you enjoyed the post Daniel! I’m seeing a lot of new good looking ceramic pots and pan sets out there these days. It had me wondering if they cook meals better (more evenly) or faster or anything like that? I am in the market for a new frying pan and am stuck. I have always just used anodized aluminum w/ teflon but I use cast iron for steak. I appreciate the breakdown comparison and cleaning tips. Hey Lev, great question, like I mentioned each material is going to have it’s own pros and cons, it really is a personal preference of which one you decide to cook with. Most of the cookware we have is t-fal or faberware. 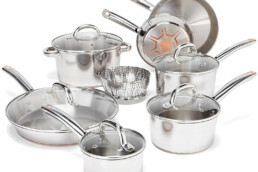 With Christmas coming, it is a good time to look at new cookware! My spouse loves it when I get new cooking things. Not only do they spruce up the kitchen, but those first meals cooked in a new pan are some of the best (in my opinion!). I had not before thought about how certain metals react with certain foods. Our t-fal aluminum pans always seem to get yucky, but perhaps it is because we make a lot of fried green tomatoes! I think the T-fal E765SC Ultimate Hard Anodized Scratch Resistant Titanium Nonstick 12 piece set looks like it might be under the tree this year! It is within my price range and from your review, it sounds like it will allow me to keep frying those green tomatoes without ruining the integrity of the pan! The Vremi Cookware Parent set also looks to be a good one. But then, I think I will get what I pay for, so the lower price tag might not mean the best one. My spouse really wants to get some copper cookware, though, too. So maybe the BulbHead (10824) Red Copper 10 PC Copper-Infused Ceramic Non-Stick Cookware Set. It is still in my price range and would sure make some happiness in the household! Thank you for the review and giving me some great ideas for my shopping list! You’re welcome Karin, fried green tomatoes sound great right now! Hey Fran, listen to your friends! I never use soap on cast iron, as you cook on it overtime the pan is “seasoned”. Each time you cook on it you will be killing any old bacteria that might be on the pan but that shouldn’t be a worry as long as it dries. If you have any tough debris you can get off you can try using a salt paste to help scrub. Thanks for all the info. It is a great source for comparisons of all the cookware and the materials. I notice you say not to forget to wash cast iron cookware with soap and water. Doesn’t the soap destroy the non-stick surface. That seems to be the case in my experience. Also, I had some interest to check a set on Amazon and found that they won’t ship to me in the Philippines. I also suspect that the shipping cost would be too high to bear even if they did. 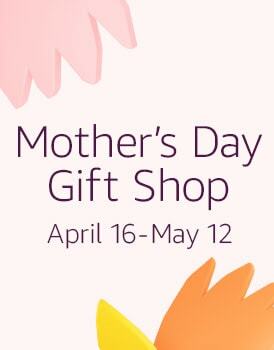 Should I keep looking for items that will ship here that are coming from sites in Asia? Any advice? Hey there, good catch I meant to say do not use soap on cast iron, just changed that. Yes I would just look for businesses in your area.